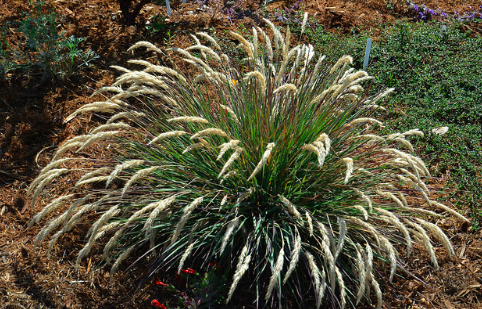 Mendocino Reed grass is a regal plant from the northern California coast. Well scaled for gardens a 1′ x 2′ wide clump eventually forms with stiff, tidy blue green arching leaves that are blue with purple highlights. In spring to mid-summer 1′ tall spikes of flowers that begin russet and age to soft tan appear and are immensely showy and symmetrical. A back lit plant in bloom is a festival of brilliant tones. Best in light shade and average to rich, well drained soil with light summer water to improve vigor and appearance. 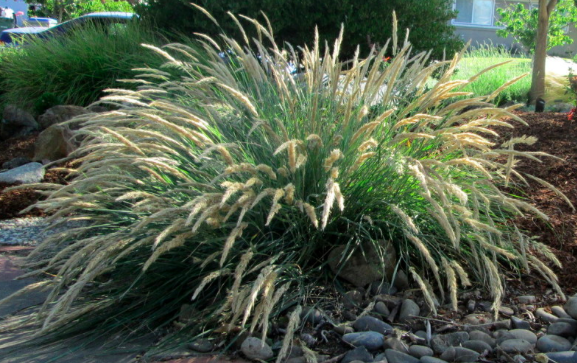 A cool season grass that looks wonderful in winter as well as summer. Excellent garden plant that has proven to be easy and adaptable. Evergreen.